I have to be honest with you all. 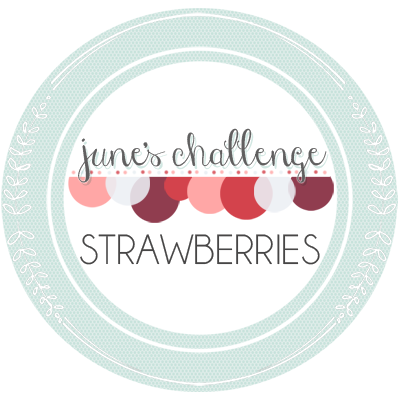 This month's challenge...was a challenge! Not so much because of the ingredient- I'm a total fan of spinach and have about 1,000 recipes pinned all over the place featuring the stuff. It was allllll because the recipe I picked out to make and you know, already bought all the ingredients for...needed an oven. For over a half hour. In the craziest heat wave we Southern Californians have seen yet this year. I waited and waited...saying to myself and poor Samantha, "it's supposed to be a lot cooler on ______ so I'll make my recipe then!" Only to have that day be hotter than the previous. I hate being a last-minuter, but shoot- this time I totally was. I finally got to the point where I couldn't wait another day and needed to bake this sucker regardless of the temp outside (which was exactly 97°F and about 80°F in my house). Oh and did I mention we don't have AC in our place? No one really does around where we live. We're so close to the beach that we hardly ever get a heat wave like this...but when we do, SHOooOOOOooooOOOT we suffer big time. I may have also had a fiery heat related tantrum or two along the way. Ooops. Samantha on the other hand- A LOT smarter than I was! She made such a delicious looking sandwich...and oven free! Girl, I'm so jealous! It reminds me of my favorite panini my husband and I get from The Corner Bakery! I'm making this stat! 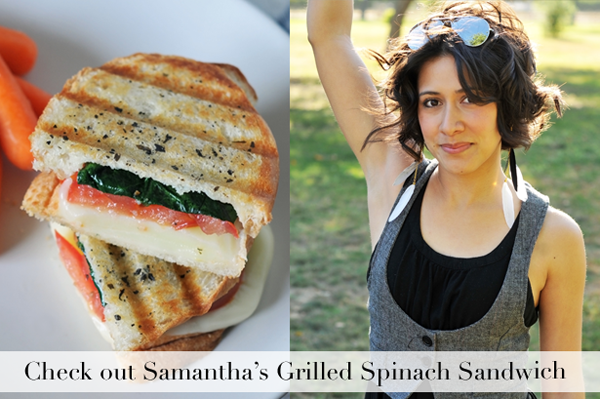 To see Samantha's recipe, click here. This pie is totally worth all the sweaty tears I may or may not have shed. It's easy (as pie??) to make, feeds a large amount of people, is filled with super flavorful ingredients (Hellllllo Feta and Pecorino cheese!!! ), and has the crispiest, crunchiest topping everrrrrrrrr! With every bite I took, my heat filled frustrations slowly dissipated. That's a good pie. 1. In a large nonstick skillet, heat your olive oil over medium high heat. Add your chopped onion and cook, stirring occasionally until translucent and starting to brown- 3-5 minutes. Add garlic and salt and cook until fragrant- another minute or so. 2. Transfer onion and garlic into a large heat proof bowl and add your thawed and drained/squeezed out spinach. 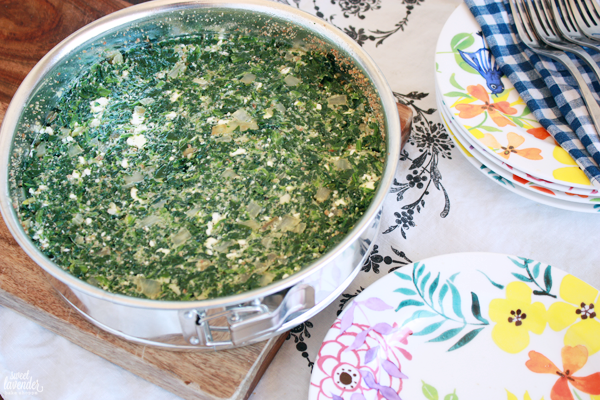 Stir to combine, breaking up any large chunks of spinach with your spoon. Next, crumble in your feta cheese and stir to combine again. Add the pecorino/parmesan, dill, nutmeg and pepper. Stir again. 3. Next, add in your 1/4 cup of homemade breadcrumbs. 1. 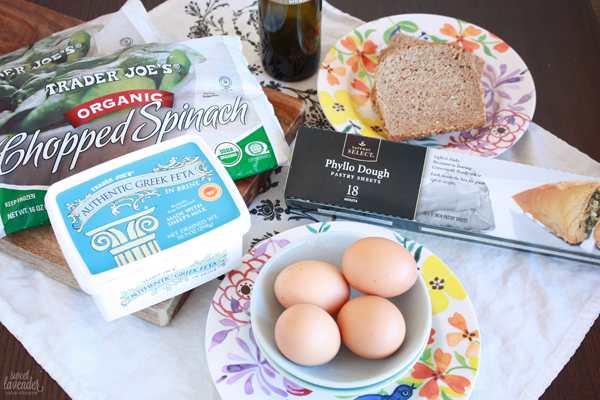 Take out 3 slices of good quality bread and allow to sit out on the counter, overnight, or until completely dried out. 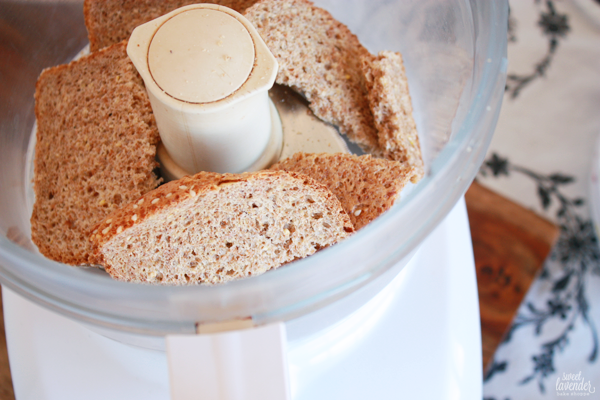 You can also dry out your slices of bread in an oven with low heat until hard and moisture-free. 2. 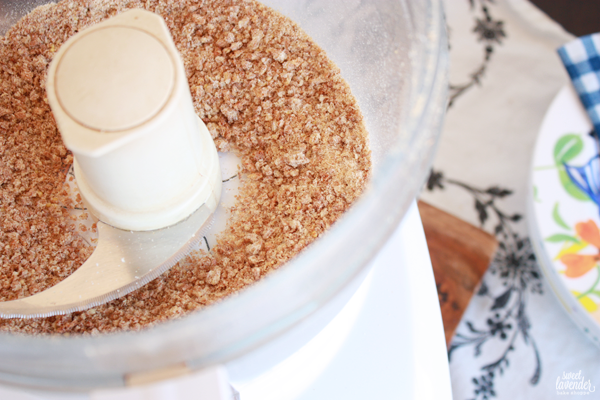 Then just add bread to a food processor and blend until bread crumbs form! Can be stored in an air tight container in your pantry for almost ever. 4. After you've added in your breadcrumbs to the mix, gently fold in your beaten eggs. Mix until completely and thoroughly combined. 5. Next, prepare your pan. Lightly spray the sides and bottom of a 9" springform pan. You should have more breadcrumbs left over, if so add the remaining crumbs to the bottom of your pan and "flour" it (like you would a cake pan when baking cake) by tapping pan on a counter and making sure all of the bottom is coated with the crumbs. Tap out any excess. 6. 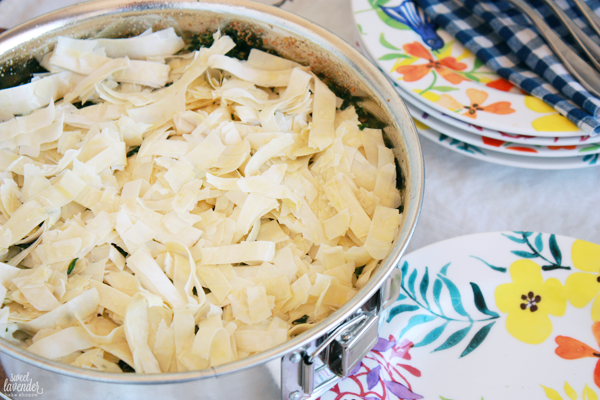 Add spinach mixture to your prepared pan, smooth out top, and flatten so it is really in all the sides. Set aside. 7. Preheat oven to 375°F and make sure the rack is in the center. 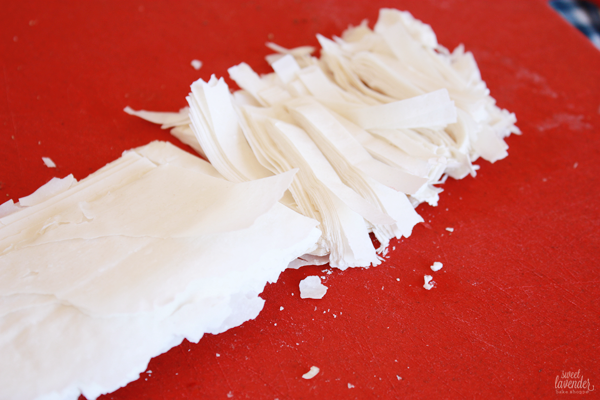 Into a large bowl, add your sliced defrosted phyllo dough and toss gently to break up any slices stuck together. Add 1/4 cup olive oil to the bowl and toss gently to coat all slices evenly. 8. 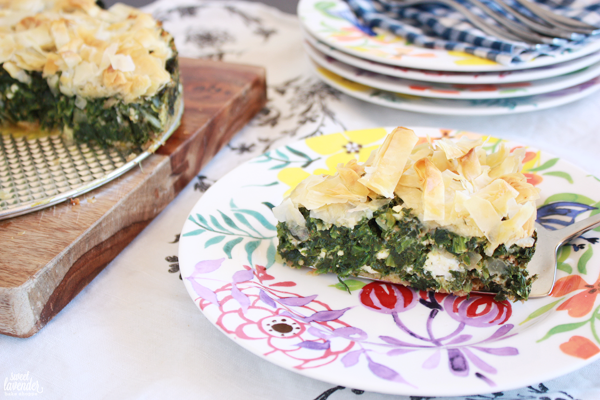 Cover the entire pie with your phyllo slices, place into your preheated oven and bake 35-40 minutes, or until topping is golden brown and pie is completely cooked through. 9. Let pie cool 5-10 minutes before removing side of pan. Once it has cooled a tad, run a knife around the edge to loosen sides, carefully release spring and remove. Don't have phyllo? No problem, you can top the pie with more breadcrumbs tossed with a little olive oil, or even more parmesan or pecorino cheese. 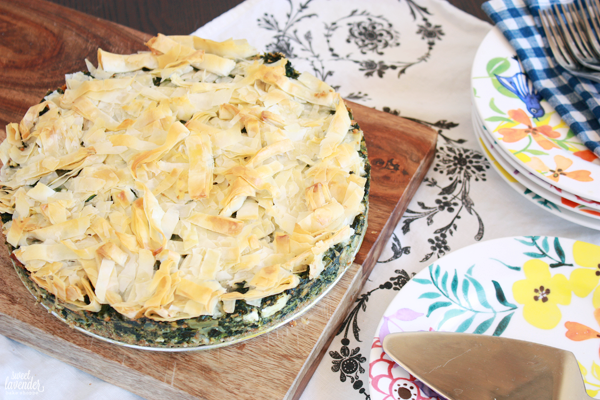 The phyllo definitely gives this pie a nice crunchy top, so if you can find it, grab some! This pie can also be assembled up to the baking step and then wrapped and frozen for up to 3 months! When you're ready to bake, simply unwrap and bake straight out of the freezer, for about an hour or so. Also, if you are interested in doing a giveaway or looking to advertise your blog and/or shop, head on over here and find out how to do so! Now through the end of May use code: MAYFLOWERS for 20% off any and all ad spots here on Sweet Lavender Bake Shoppe! 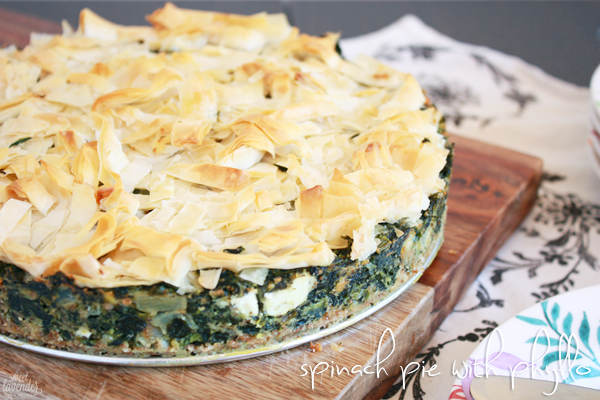 Thanks for sharing this amazing recipe and for hosting this linkup. I really enjoy it and it allows me to be creative. wow, girl. you are so incredibly talented. it looks delicious and oh so pretty! oh, and strawberries!?! yay! can't wait! Thank you so much for your words of encouragement Jenna :) AND RIGHT?!? I'm ALL about strawberries! 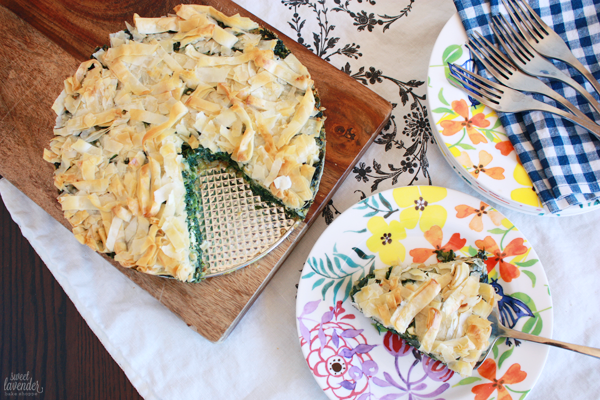 Phyllo is really such a fun dough to use. I tend to neglect the stuff because I just never think to use it. But then when I DO actually use it I'm like, "Oh yeah! I freaking love this stuff!" I kept wondering about your AC. I always forget how much cooler it is for coastal downs. We have plenty of hots days in our neck of the woods. I can't believe how hot is was! But girl, you did so awesome! I'm super pumped about strawberries. I thought about baking something and then threw that idea out the window. Christina Main blog. shop. twitter. facebook. pinterest. Hahaha thank you! You see, YOU'RE the smart one. I was just dumb and determined. Or maybe a glutton for punishment. Either way, I'm glad it's over!